Unless you’ve been pulling a David Khan and willfully turning a blind eye to talent, you’re most likely aware that the 2018 NBA Draft class is Peter O’Toole-loaded. This class is laden with multiple legitimate candidates to be multiple time all-stars, and a few of those with the potential to ascend to All-NBA level and possibly compete for an MVP. In this series, I’m going to be taking a look at the upper echelon of the class, and breaking down who I perceive to be the top pick and attempt to dial in what we’ll likely see from them in the future. The first whipper-snapper that I’d like to put under the microscope is Marvin Bagley III of Duke University. Full transparency: I might have a basketball man-crush on this dude. It’s very possible that Bagley is the best player we’ve seen in college basketball since Anthony Davis. Bagley choosing to be a Blue Devil was a case of the rich getting richer, because their frontcourt cupboard was hardly bare. They’d already signed Wendell Carter, a guy who was widely considered the best back to the basket scorer in the class, and another probable top-10 pick. He’s an extremely talented player that we’ll look into later. 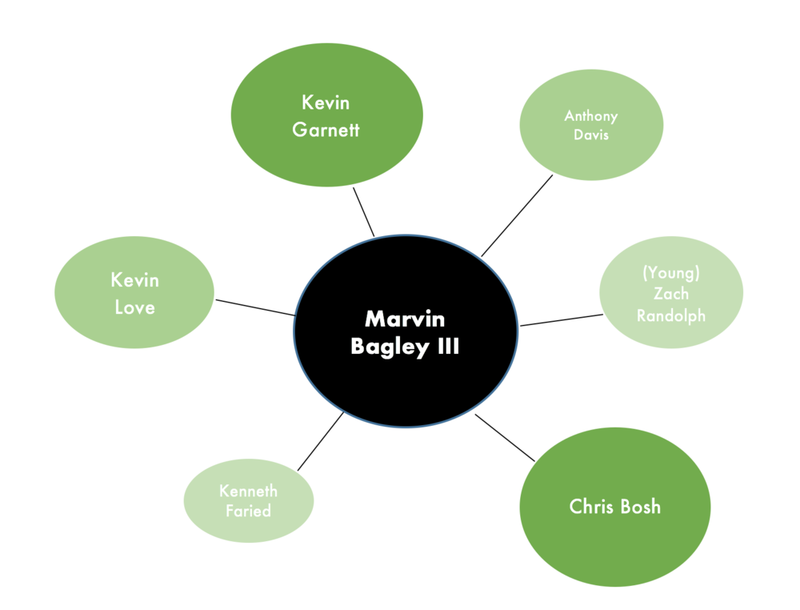 That said, when you can snag a guy like Bagley, the rotation hardly matters, because his skillset spans wide across the spectrum of hoops gifts. He starts for every college roster in America and would likely start for several NBA teams right now, as a 19-year-old. Bagley is 6’10” in shoes with a 7’0″ wingspan, and his agility/mobility really help him get the most out of that size. Wingspan-wise he’s not in the realm of Porzingis/The Brow/Giannis, and this’ll affect his game in some ways we’ll discuss in a bit. He weighs in at about 235 pounds and has a real fluidity to his gait. He glides up and down the floor effortlessly, and there’s no trace of the plodding motion you see in a lot of injury-prone bigs. Other than tremendous ball skills for a guy his size, the first thing that jumps out at you is how tremendously active he is on both sides of the floor. This is a guy that refuses to be blocked out, and he’s got a real knack for tipping the ball to himself. There are literally hundreds of instances like this one, where Bagley one, two or even three taps the ball to himself so that he can snag it. That’s a trait you see in the tippy-top elite rebounders. In this clip you can even see that this translates to bad entry passes: they can even be salvaged because of his awareness of where he is on the floor and his touch around the rim. Again, here, Bagley refuses to let Theo Pinson get low on him and gets to a high percentage area in the lane to tap it to himself. It’s also impressive how often Bagley sprints the floor, regardless of what’s happened on the previous play. In that sense he appears to be a pretty positive teammate. It’s insane to think that, while Bagley is averaging 21.2 points-per-game on 13.6 attempts, a wildly efficient set of averages for a freshman at a high-major program like Duke, his rebounding might be his most translatable and effective skill. On top of that: this kid was a wicked fast second and third jump, and he typically knows if he’s missed. He also loves to tap in shots that he knows are coming off the rim. Unfortunately, it’s not applicable, because Bagley’s right-hand is a last resort. A lot of the time he actually seems to be avoiding it. If you force him to his right, his ability to finish radically changes. Definitely not an ‘over either shoulder’ type of guy that you often hear pros talk about, but he’s not without hope, because he does have a high basketball IQ and polished ball skills for a guy his size. However, at the moment, a lot of Bagley’s right handed shots going right come off like flat shot-putts, and his touch noticeably decreases when he goes that way. It’s a correctable plight, and one that will definitely require attention as he faces longer wingspans at the next level. Bagley’s wingspan is not exceptional for his height, and this will force him to develop as a finisher around the rim. At this point, we just really don’t have a credible sample size to conclude that Bagley is dangerous in a jump shooting position that isn’t squared up and set. He seldom takes those shots. A lot of that could be due in part to the fact that no big in college basketball can stay in front of him. Even undersized hybrid 3/4s seem to struggle with his quickness, and if not that, his length. We’ll have to settle on the jury being out, here. That said, for the activity that Bagley provides under the rim and the alarming efficiency that he plays with, his shot mechanics are strong. He already shoots the three better than the players he is frequently compared to. Duke at times this year has been uncharacteristically terrible on the defensive end, which is likely due to their inexperience and the frequency in which they’ve faced patient offensive teams that are aware of this. They’re currently 89th in the country in defensive efficiency according to Ken Pom, and it’s a common occurrence to see perimeter savvy teams take Duke late into the shot clock knowing that they’ll get lost on switches or break down in their communication. Bagley falls into the mix here, as most freshmen do, but again, it’s hard to imagine him failing to improve in this area, considering his physical tools and his motor. Watch Chris Chiozza (a lightning fast senior guard for Florida) size Bagley up and fail to escape him. Granted, that’s a weak take, and Chiozza is a small guard, but Bagley’s footspeed and quickness to the shot’s release point is exceptional. His ability to jump quickly compensates for some of his shortcomings as it pertains to freakish wingspan. The most encouraging aspect of Bagley’s ceiling going forward is the fact that his development will not involve the trimming of daunting bad habits. This is a 19-year-old that’s stayed consistently in the top five in efficiency for an entire season against great competition. If you consider the baseline of his skills as they stand, it’s hard to imagine him not improving at finishing with his right hand or becoming a dangerous jump shooter in pick and rolls situations. This kid has no real delusions about what he does well, and that’s something encouraging to see in a prospect. He can make threes, but you don’t see him floating around the perimeter. He can handle the ball, but you don’t see an inkling of ‘my turn’ or ‘Imma cook this fool’ that lead to turnovers. Bagley could be an All-NBA level talent. It would be surprising to me if he didn’t (barring injury, knock on anything even resembling wood… knock on Harvey Weinstein near a young actress if you have to) nab 5+ all-star appearances in his career. His touch around the rim, otherworldly ability to end possessions, keep them alive and his ceiling as a pick and pop shooter make him a fantastic option as a small-ball five in some lineups. Bagley is an active ingredient in just about any formula listed here, but should the Suns find theirselves at the top, I think they’d be picking between two hometown guys in DeAndre Ayton (starring at Arizona) and, obviously, Bagley (from Phoenix). I plan on deep diving on Ayton soon (probably next), but the deciding factor between these two is consistency, in my view. Bagley always shows up. He loves big stages. He goes hard all the time. He has that unmistakeable ‘I will destroy you and everyone you ever knew’ instinct. He is notprone to having sleepy halves or games. Is Ayton more offensively talented than Bagley? Possibly. Perhaps even probably. Ayton eclipses Bagley in some key areas, but those areas are moot if he continues to periodically let the spirit of Derrick Coleman possess him and become disinterested in playing hard. So which do you bet on? Do you bet on DeAndre Ayton shedding those stretches of disinterest? It’s possible that he gets pissed and becomes one of the best bigs in the NBA. It’s also possible that he doesn’t. To me, it’s way less of a gamble to pair Bagley with Devin Booker and Josh Jackson and build your franchise for a bright future. He’s the safest bet in the draft and I think he should go #1. How Good is James Wiseman?